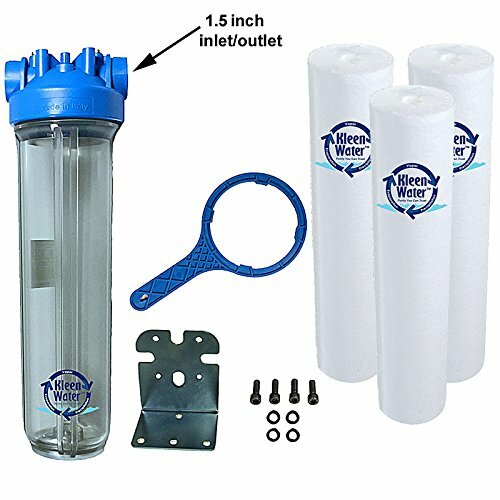 Complete Whole House Water Filtration System with 1.5 Inch Inlet/Outlet by KleenWater. This convenient KleenWater package is an impressive value and is ideal for residential and even light commercial / industrial applications. Our filter housing is manufactured in Italy from the highest quality and safest materials. The transparent sump is constructed of polyethylene which is considered very safe by scientists adept at the effects of plastic in the food and beverage industry. Polyethylene is also very recyclable. It is manufactured with a proprietary procedure saving up to 60% of energy in injection molding compared with standard plastics. The transparent sump allows for visual inspection of cartridge condition. This filter is very rugged and boasts a 120 psi maximum working pressure. A built-in pressure relief vent, sump drain and a spanner wrench are included for easy periodic cartridge change out. Please note replacement o-ring is model PWFRG357. A spare o ring is recommended to avoid an urgent situation. The (3) KleenWater meltblown cartridges are rated for 5 microns.To provide perspective to the 5 micron sediment entrapment rating it is important to note the naked human eye can see down to 20 micron and a human hair is 100 microns in diameter. Please enter KW4520G in the Amazon search bar to shop for cartridge replacements. The mounting bracket provides the strength and rigidity required for a sturdy installation. - dimensions 7 .5 inch (W) x 28 inch (H). If you have any questions about this product by KleenWater, contact us by completing and submitting the form below. If you are looking for a specif part number, please include it with your message.